When you buy a product, say, motor car or bike, do you consider investing in the manufacturing firm (Hero Motocorp or Mahindra & Mahindra) as well? If the company is good, perhaps you should. Small amounts that you spend on your favorite products would have grown to if you had invested the same money in buying the stocks of the Company. Here’s how much you would have made if you had bought the shares of some such reputed companies several years ago. 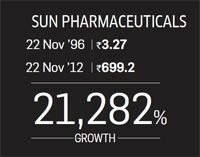 Sun Pharmaceuticals leads the race with an incredible 21,282% growth since November 1996. Besides spending Rs 300 a month for medication from this leading pharma company, if you had invested in its shares, your money would have grown 21,282%. 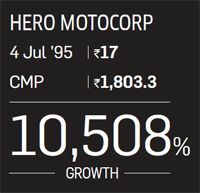 Hero Motocorp is second in race with magnificent gains of 10,508% since July 1995. 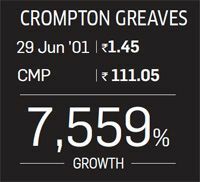 Crompton Greaves is third in race with returns of 7,779% since June 2001. Though Crompton Greaves’ stock price has taken a beating during the past year, for home renovation you must have purchased electrical fitting of Rs 2,500, the money would have grown more than 76 times. 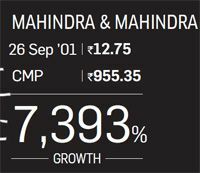 Mahindra & Mahindra stock has given returns of 7,393% since September 2001. If you had bought a Rs 7.5 lakh multi-utility vehicle from M&M back in 2001, and had also purchased its stock, your investment would be worth Rs 5.6 crore today. 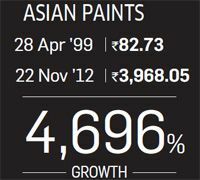 Asian Paints stock has given returns of 4,696% since April 1999. You might have used this paint brand for your house years ago. If you had invested an equivalent sum in the company in 1999, your investment value would have increased 48 times by now. 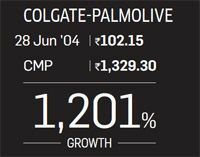 Colgate Palmolive stock has given returns of 1,201% since June 2004. Every year you spent Rs 600 to buy Colgate toothpaste this small amount would also have made for a good investment. Your money would have grown 13 times, or 1,201%, by now. 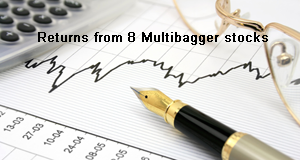 BPCL stock has given returns of 899% since April 1999. 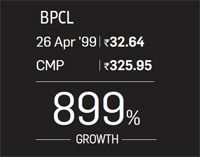 Suppose you spend Rs 6,000 on petrol 1999 on BPLC petrol pump, if you had also placed an order for an equivalent value of BPCL shares, you would have had nearly Rs 60,000 today. 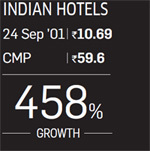 Indian Hotels stock has given returns of 458% since September 2001. Did you enjoy a stay at one of the hotels run by this company while on a vacation? If you had bought its shares at the same time, the investment would have grown 5.5 times today, or 458%. Essence of this article is to make yourself aware that you spend small amount on various needs think of investing same amount in stock of good company to fulfill your long term goal.